All businesses and public institutions rely on promotion in some form or another in order to notify people of who they are, what they do and how to get involved. Churches are no different. Although a lot of advertising is done online, institutions such as churches still rely heavily on outdoor advertising. In this instance, external noticeboards are a go-to solution. We have produced hundreds of external noticeboards for churches all over the country, and there is no sign of things slowing down any time soon. It’s all well and good producing lots of them, but why are external noticeboards so popular with churches? One of the biggest benefits of external noticeboards is that they are low on cost. With prices from as little at £36, it’s no wonder they’re a popular choice. Whatever way you look at it, churches are a form of business. They have a budget and various expenses they need to cover. With most of the money being spent on staff, building maintenance and charity programmes, there’s not much left for marketing. That being said, no business can survive without marketing. External noticeboards require little money but provide effective advertisement nonetheless, and that’s why our Wall Mounted External Noticeboardsare so popular. All public buildings have to adhere to strict fire safety laws, and churches are no different. Whilst a lot of people think this just applies to large items like pews and furniture, it also applies to smaller items too. No one wants to get caught out, but it’s easy to do so when buying things such as noticeboards. You can rest assured that all of the noticeboards in our external noticeboard range are fire retardant certified in line with current laws and legislation. This means they won’t actively contribute to a fire or to the spread of a blaze, allowing you to install your board with a clear conscience. Sometimes, the hardest part about creating an effective display is having the space to do it. Wall mounted external noticeboards are our bestselling noticeboards and they affix easily to outside walls. That being said, not every church will have the option of attaching a board to an external wall. Listed buildings and those that are older and more delicate won’t be suitable for this type of board; in which case a Post Mounted External Noticeboard is best. 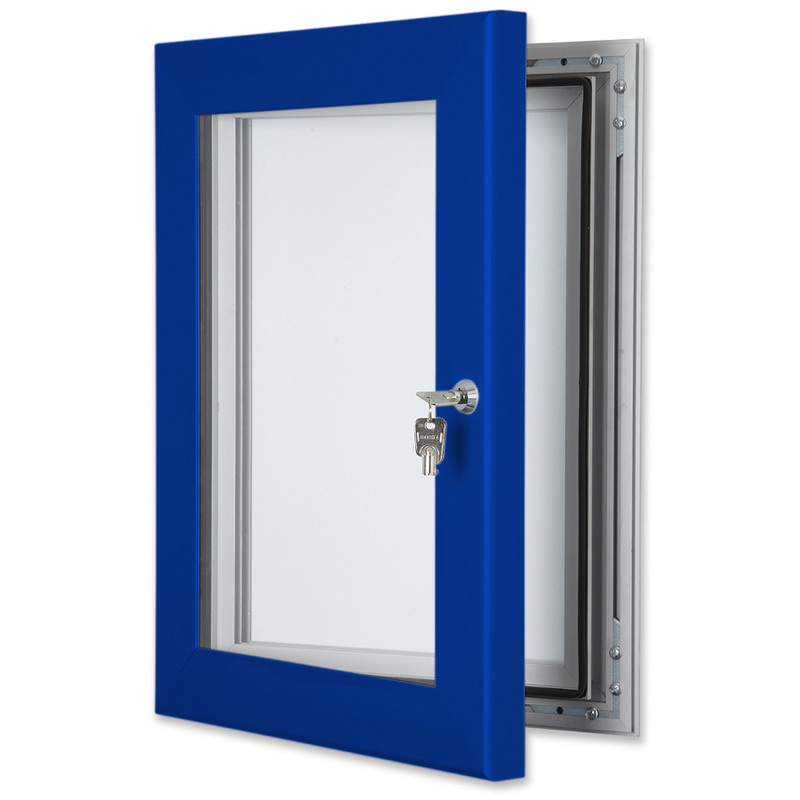 We provide three types of post mounted noticeboards: a Single Post Mounted External Noticeboard, our Standard Post Mounted Noticeboard and the WeatherShield Freestanding Lockable Showcase. These types of board stand outside and are installed into the ground – causing no harm to the building. They are easy to remove should you need to, and equally as easy to re-install. Churches are often grand buildings with a lot of intricate architectural detail. Whilst this is beautiful to look at, it can make driving attention to your important notices quite tricky. Our wall mounted external noticeboards are available with 14 different frame colour finishes, including brighter shades that will contrast against the building but that won’t look unsightly. We recognise that in areas of natural beauty, you don’t want to take attention away from your church, and there might even be restrictions on what you can install. In this instance, you choose a more subtle shade like silver or brown so that it blends in more. Our wide colour range allows us to cater for all types of churches; from the bold and vibrant to the more traditional and understated. Each external noticeboard is fully weatherproof and won’t let you down, even in the harshest of weather. All noticeboards are watertight, meaning your display materials inside won’t get wet. They are also extra secure, so vandals won’t be able to get in and graffiti your display. Being so durable means you won’t have to spend money on a replacement because one noticeboard will last you a lifetime. There are so many other benefits to our range of noticeboards, including their versatility, sleek finish and easy usability. If you think your church or your local place of worship could benefit from an external noticeboard, contact us or call us on 01733 511030.